It is no secret that cigarette smoke has detrimental ramifications in the human body. In fact, a study published in 2008 cited tobacco as the single greatest cause of preventable death internationally. Common conditions with which cigarettes are related include: heart attacks, strokes, chronic obstructive pulmonary disease (COPD), and various types of cancer. In fact, each cigarette smoked is estimated to shorten life expectancy by 11 minutes. By now, these statistics are commonplace in American society. Most, if not all, would agree that cigarettes are harmful to one’s health, but smoking cessation (quitting) can be troublesome for a number of reasons. A major cause of difficulty is the common occurrence of nicotine addiction. That being said, studies have suggested a link between nicotine addiction and the endocannabinoid system; the latest of which suggests that Cannabidiol (CBD) could be of assistance when trying to quit smoking. A team of researchers from University College London published a study in the September issue of the journal Addictive Behaviorsthat investigated whether low doses of cannabidiol (CBD) would help treat nicotine addiction in tobacco smokers who want to quit. The research team, led by Celia J.A. Morgan, used a double-blind, placebo controlled model for their study, which consisted of 24 participants (12 male, 12 female) between the ages 18-35. In order to take place in the study, participants were required to smoke, on average, more that 10 cigarettes per day. That being said, they must also have expressed a desire to break the habit. Participants were asked to record the amount of cigarettes they consumed during the week prior to treatment. After baseline testing, they were split into two groups. Each group was provided with an inhaler – One group received CBD and the other received a placebo. They were then instructed to use the inhaler whenever they felt the urge to smoke. During the course of the treatment week, participants were asked to record their inhaler use and the number of cigarettes smoked in a journal. Additionally, participants were asked, via text message, to rate their current level of craving once per day. 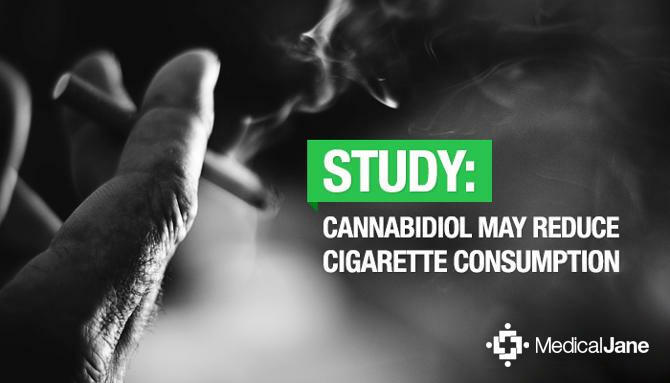 According to the study’s results, the group receiving cannabidiol (CBD) treatment experienced a significant reduction in the number of cigarettes smoked. The same cannot be said of the placebo group, as there was little-to-no change from pre- to post-treatment. Interestingly, the decreased cigarette consumption occurred despite the fact that there was no change in the level of craving reported each day.